MILAN -- Fiat S.p.A. is counting on Lorenzo Ramaciotti, the designer of the Ferrari 612 Scaglietti, to make Chrysler models appear at home in both Detroit and Milan. The 63-year-old, lured out of retirement in 2007, is leading efforts by the automaker to create a common styling for Chrysler and its Italian sister brand Lancia in a bid to save costs and more than double their sales by 2014. The strategy attempts to create a family resemblance from models that stretch from urban subcompacts to spacious minivans. "We are trying to find an international language, which could have a place both here in Italy and in the U.S.," Ramaciotti, who heads design at Fiat and Chrysler, said in an interview in Turin. "If you put all the models into the showroom, they must fit together. It's a delicate problem." Sergio Marchionne, CEO of Fiat and Chrysler Group, combined the two nameplates to forge a competitive global automaker out of the struggling Italian company and the formerly bankrupt U.S. manufacturer. Chrysler and Lancia are meant to appeal to mid-market consumers to lead a 64 percent surge in group sales to 5.9 million vehicles by 2014. Fiat targets combined Chrysler and Lancia deliveries of 800,000 vehicles in three years, up from about 300,000 now. The merger of the two brands kicked off in June, when Marchionne pulled the U.S. brand from continental Europe to favor Lancia, which is dependent on sales of compacts in debt-strapped Italy. 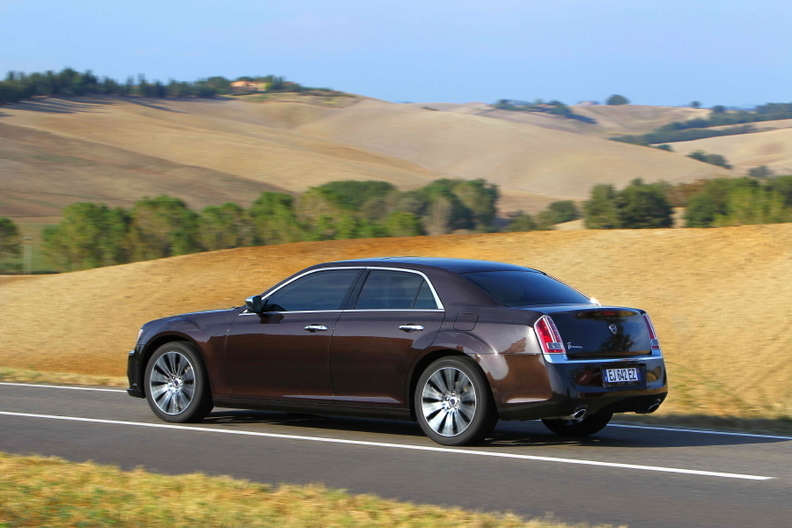 The Chrysler 300 sedan has been rebadged as the Thema for Lancia, while a minivan is being sold as the Voyager. The strategy creates a challenge for Fiat as it seeks to balance reduced spending on new models with consumer expectations for a car that's supposed to be local, said Roberto Verganti, author of the 2009 book "Design-Driven Innovation." "It's extremely difficult to succeed in a strategy of globalizing design," said Verganti, a management professor at Milan Polytechnic. "The risk is making international cars with no personality. When you buy a Lancia, you are looking for a piece of Italy, and when you choose a Chrysler, you are getting a slice of America." The Chrysler-Lancia combination is an exception for Fiat. Other brands, including Dodge, Jeep, Maserati and Alfa Romeo, will retain their unique American and Italian identities, regardless of where the vehicles are sold or built, said Ramaciotti, who spends one week a month in Detroit to oversee design projects. Lancia is a weak link for Fiat in Europe, where the Italian carmaker loses an estimated 800 million euros a year ($1.08 billion) as it struggles to compete with Volkswagen AG. Fiat's market share in the region fell to 7.1 percent through October from 8 percent a year earlier, hurt by slack demand in Italy and an aging line-up. The mid-market Italian brand, which aims to introduce five new models over the next three years, won't likely reach its target of more than doubling annual sales from about 100,000 vehicles now, said Pierluigi Bellini, an analyst at IHS Automotive in Milan. "It's very difficult for Lancia to boost sales significantly because it sells about 90 percent of its cars in the depressed Italian market," Bellini said. Before Lancia added the two rebranded Chrysler models, its offering consisted of the 12,600-euro Ypsilon subcompact, the 17,040-euro Musa compact and the 20,470-euro Delta wagon. The Chrysler models, which went on sale this month, could broaden its appeal. So far they've at least been attracting curiosity. "People are coming into the showroom to have a look," said Roberto Ferrari, who owns a Lancia dealer outside Milan. "Reactions are good. The Thema is pretty, design is attractive for Italians, too, but no one is buying these kinds of cars now," because the debt crisis calls for understatement. Fiat targets annual deliveries of 10,000 Themas and 11,000 Voyagers, helped by the combination of the two brands' dealer networks, which boosted Lancia's sales outlets 40 percent to 650 stores. Last year, Chrysler sold about 2,500 sedans and wagons of the 300 line, while delivering 5,600 Grand Voyager minivans. Chrysler has struggled to establish a foothold in Europe compared with General Motors Co. and Ford Motor Co., which both outsell Fiat in the region. The U.S. carmaker bought a stake in France's Simca in 1958 and then sold its European operations to Peugeot in 1978. Under Stuttgart, Germany-based Daimler AG, the brand renewed its effort in Europe, with sales peaking at about 120,000 cars in 2007. Overall, Chrysler sold about 37,000 cars in Europe last year, including Dodge and Jeep models. The re-badging, a quick and cheap way for automakers to share models, has shown some signs of success. The Fiat Freemont, the European version of the Dodge Journey, has received about 18,000 orders since its June debut, more than double the model's peak sales of 8,300 in 2009. Still, the ambitions of Ramaciotti, who developed cars including the Ferrari 550 Maranello and the Maserati Quattroporte during more than 30 years with designer Pininfarina SpA, go beyond slapping a new label on a car. "We don't want to do pure badge-engineering; it has never worked well in the long run," said Ramaciotti, who gave up his retirement plans to join Fiat and designed the Maserati Kubang sport-utility vehicle concept introduced in September. "We should be global in sharing platforms and strategies without dulling the product line." To get a mix of U.S. and Italian input, teams in Detroit and Turin are competing to develop a design language that can suit both brands, Ramaciotti said, adding that the styling would evolve as new products get released. In the meantime, Italian flair is already finding its way into Chrysler cars with a version of the 300 getting leather interiors from furniture-maker Poltrona Frau S.p.A.
"It's hard work and a long way to go for Chrysler and Lancia to find a common identity," said Verganti. "It's big challenge for Ramaciotti."